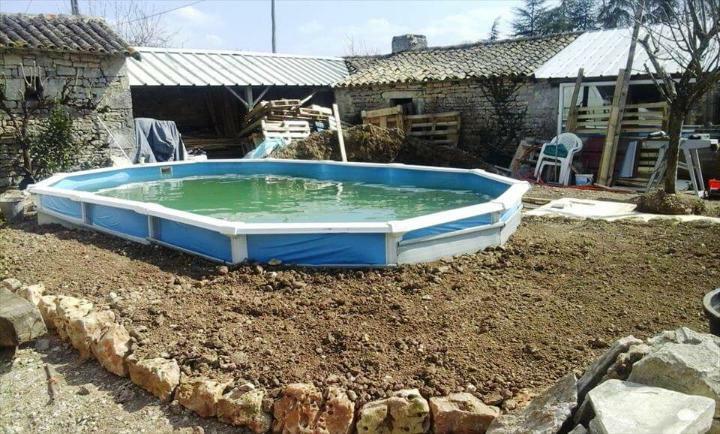 A swimming pool is center of attention of all the fun lovers in summers! 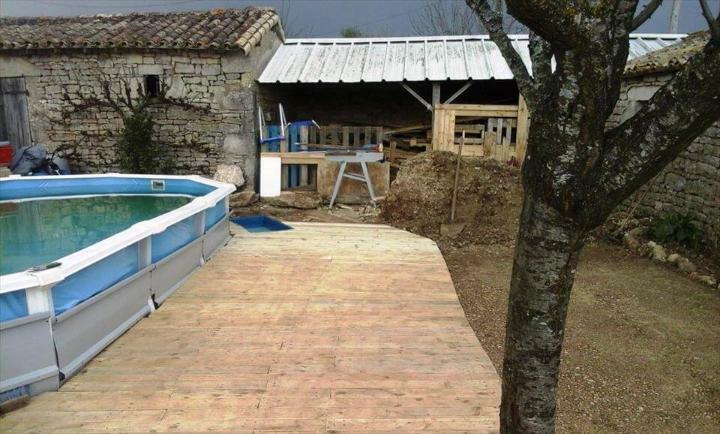 If your swimming pool needs some instant repairs or you are willing to upgrade it then we would recommend you to use pallet wood! Pallets are a big and low-cost source to super durable wood which one can get for several different home improvement projects! 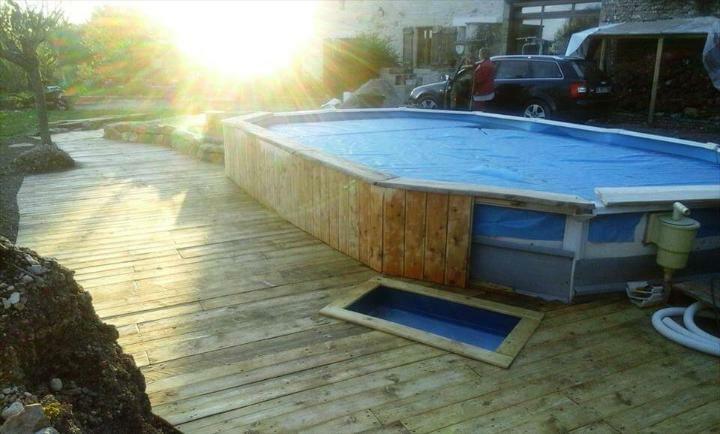 We would like you to stare a little at this DIY upgraded pallet swimming pool, pallet wood is all around the swimming pool for a magnificent wooden touch and wooden floor as well! 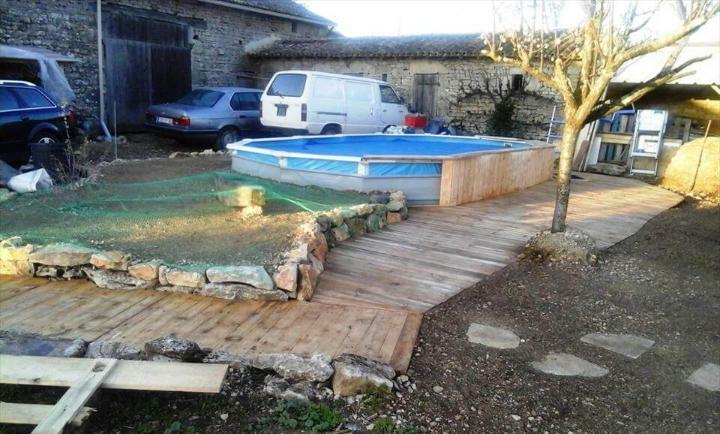 All you need to do is to level up the ground surfaces around the swimming pool! After getting the balanced ground surfaces, you can spread over the wooden rails made of pallet slats! Now just fill these wooden rails solid through cross flat alignments of pallet planks and enjoy a handsome look of your swimming pool! 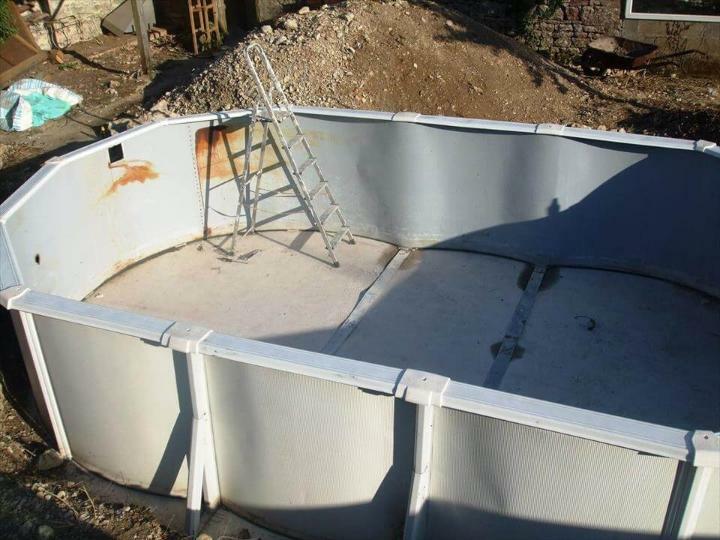 Bring also the swimming pool boundary walls to distinction by giving a wooden overlay cover! 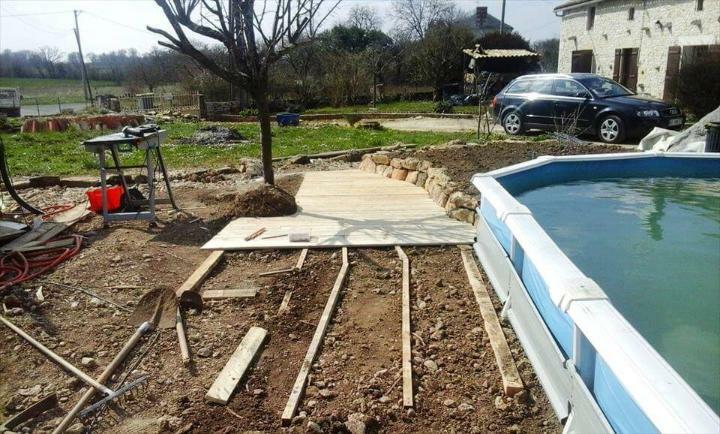 Dig the soil from the sides of your swimming pool and make it perfectly sit! Now use the rake and other leveling tools to level up the ground surfaces around the pool! Follow the removing and adding soil method to make the surfaces smoother and leveled up nicely! 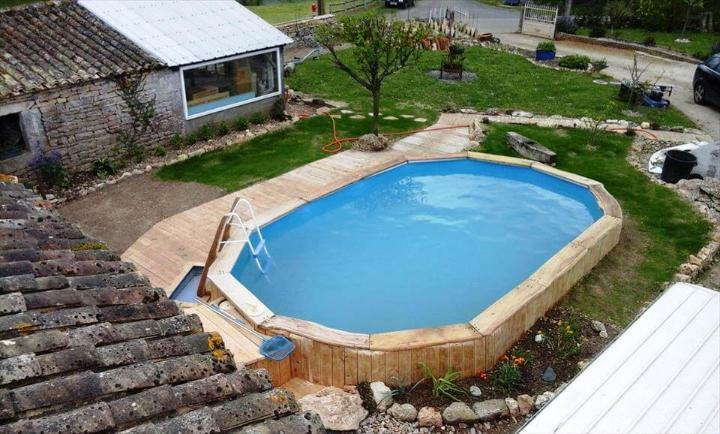 As the pool lies in a green outdoor, so the wooden flooring around the pool will also serve as a walkway! Start installing the wooden floor by installing first the wooden rails as you can see! Keep on leveling after each new addition! Bring to wooden floor to completion by following the flat slatted arrangement of separated pallet slats! 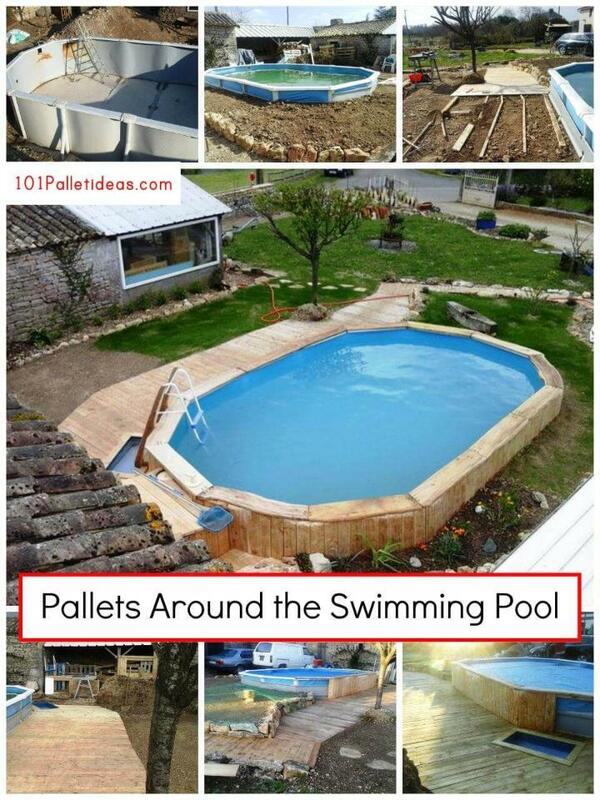 After installing the whole walkway around the pool, also fill solid the boundary walls of pool using same slats of pallets! Resize the slats and continue to adding them one by one! While securing the curvy corners and tops of the pool walls with wood, you need to be precise more in measurements and assemblage! Cut out the wooden floor to specify a spot for pool chair installation!